There was once a time when all that Nashville demanded from a local watering hole was a stage, George, Jack, and all the other necessary guys present on the shelf. 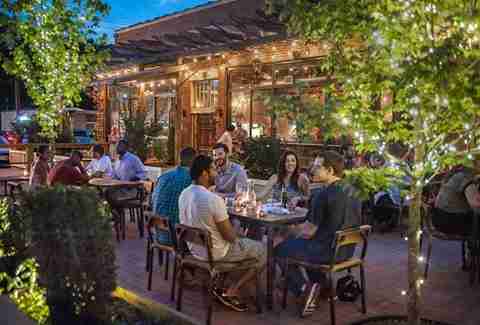 Since Music City’s bar scene has gained increasing national attention, the watering holes are beginning to look just as pretty to sober eyes as to beer-goggled ones. Here are 11 stunners that knock it out of the park. 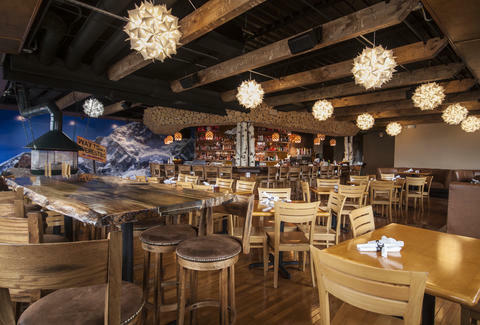 An alpine-themed, neighborhood bar in 12South, the Embers Ski Lodge aesthetic is inspired by the après-ski scene of Aspen and resort parties of Val d'Isère in the French Alps. A mural of snow-capped mountains, a vintage conical fireplace, and soft light fixtures surround the gorgeous wood bar that features stacked logs and pillars of real Aspen trees. Along the back bar, a custom metal mountain sculpture highlights the true work of art: 170-plus whiskies. Le Sel is the latest venture from Strategic Hospitality (Pinewood Social, Catbird Seat, Patterson House), and while each of their establishments is arguably their most beautiful, there’s just something about the The Bar at Le Sel. 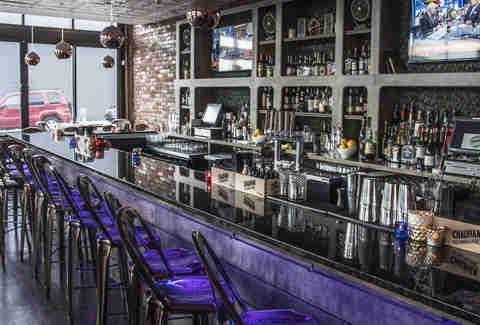 Located on the lower level of the recently opened French restaurant, the bar can be accessed through the main floor or by a separate street entrance. 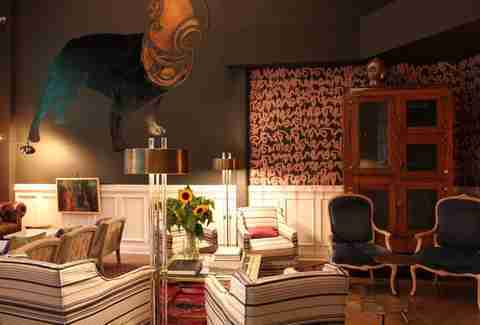 The mastermind behind it’s eccentric yet inviting style is interior designer Benjamin Vandiver, who commissioned other Nashville artists like Alic Daniel for one-of-a-kind pieces that make the space even more unique. Chef Daniel Lindley created the first design rendering for 5th & Taylor and enlisted architect firm Smith Gee Studio and interior designer Ruth de Jong to craft his vision from a nearly century-old warehouse in Germantown. Chattanooga artist Cessna Decosimo’s life-size sculpture of the city’s namesake, General Francis Nash, towers over the dining room and adjacent 28ft bar. The bar gives a residential feel, softening the space with a dividing wall of fig trees, table lamps on the bar, and lounge areas with custom furnishings by De JONG & Co. and artwork created in a collaboration between Decosimo and Lindley. Located in Morgan Park, Butchertown Hall is Germantown’s first beer hall since 1909, boasting a barrel-aged program, a “real ale” cask program and 30 rotating taps of exclusive European brews set within 2,000sqft of gorgeous indoor/outdoor settings. Metal Fred Designs Inc. crafted unique design elements like the pulley-system light pendants and the caged stone and steel walls that divide the bar and restaurant. 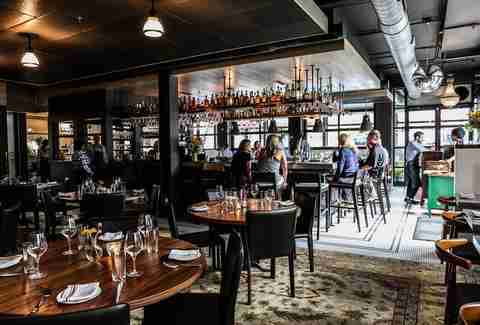 Josephine on 12South provides the upscale dining experience with the warm and welcoming vibe expected of a neighborhood classic. Antique mirrors enlarge the room while cozy leather banquettes and a sense of community around the U-shaped bar keeps the space feeling intimate and refined. A decorative shelf for storage hangs from the ceiling, outlining the bar overhead with a boozy chandelier of bottles, lights, and glasses. 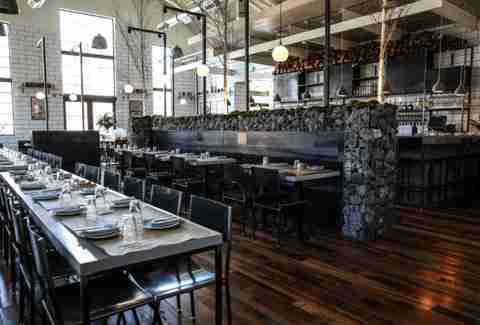 The bar backs up to an open-kitchen view and on weekends, an additional appetizing sight of chef Andy Little’s X|X (10 courses for 10 people) tasting table experience is also seated there. Renovated in a historic, 1940s movie theater, Anderson Design Group blended classic elements from the original structure like the curved staircase with modern style features (hello, Selfie Mirror!). Sinema is Old Hollywood glamour on the main restaurant level with an edgier “after-hours” bar upstairs that’s lined with plush, velvet lounge areas, private dining nooks, and legendary rock photography by Robert Knight and Maryanne Bilham. The eccentric and vibrant look of Chauhan Ale & Masala House is the result of design collaboration between 12-year hospitality veteran London Parfitt (Chauhan is the sixth Nashville restaurant he’s designed) and Nashville architect Barry Brechak. 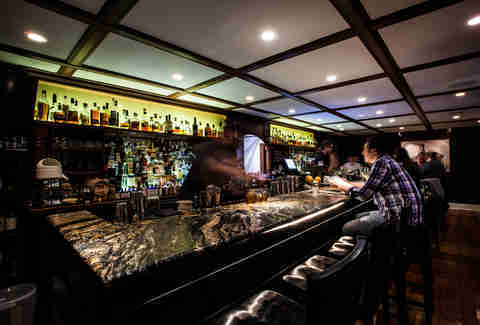 The bar style is intended to mirror an old British pub with modern accents of Indian culture, reflective of co-owner and executive chef Maneet Chahuan’s roots. The influence of Chahuan’s heritage is also carried into the bar program with their popular Indian spice-infused microbrews like the saffron cardamom IPA. Sean Brock’s Husk Nashville breathed new life into this historic 1800s home on Rutledge Hill. Designer Michael Shewan’s approach was to update its Southern style while honoring the historic integrity and keeping the original floors, windows, and walls. The bar (which was once the home’s master bedroom) is downstairs, featuring an attached patio next to the atrium with garden views and a bourbon-centric program with 60 plus bottles on the back bar. Located on the ground level of the Gulch’s Terrazzo high-rise, Prima boasts soaring heights of floor-to-ceiling windows overlooking Division Street. The bar is like a secluded corner booth with a view of the 3,000-bottle wine cellar and the pristine, white tablecloth restaurant that sits underneath a show-stopping, Bruce Munro light installation (1,800 bulbs in all). 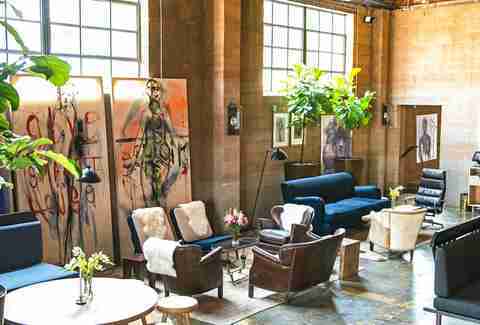 Who would imagine this stunning local favorite used to be a grocery store? 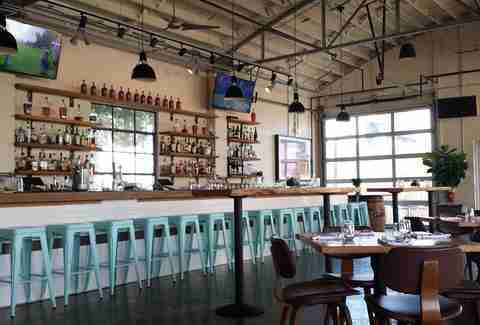 The East Nashville hangout houses two maple wood bars, a 20ft barrel-vaulted ceiling dangling 16 chandeliers, a wraparound bar that centers a pyramid of top-shelf brands and enough Italian string lights to make it feel like Christmas all year long. Holland House was a pioneer in the local cocktail revolution. 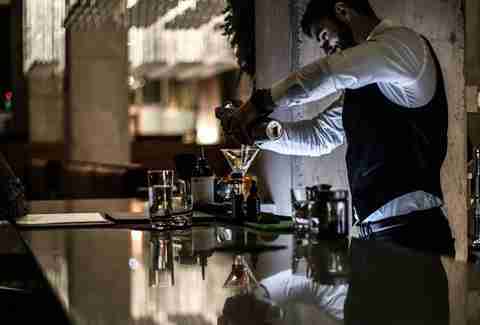 It’s definitely a place you can sit back, enjoy the romantic ambiance and trust the experienced mixologists in their craft. Kendall Mitchell Gemill is a Nashville writer who thinks that all bars are beautiful in their own ways.